It’s a mixed day on Wall Street, at least for now. Trade and President Trump looking to increase tariffs from 10% to 25% on $200 billion in Chinese goods still has the market and investors cautious. The Nasdaq and S&P500 however are now in the green, with the Dow down, albeit way off its lows. Apple (AAPL) continues to move higher and hit the $1 trillion market cap today ($207.05 per share). This is the first company to ever have that valuation. Telsa (TSLA) is also up 12% to $337.20 on the heels of its latest earnings report. On the flip side, DowDuPont (DWDP) is a drag on the Dow despite reporting earnings that beat on both the top and bottom lines and raised guidance. This is taking the material sector lower as well. Energy is also weak, with the sector down approximately 0.7% even as WTI trades higher, up 2% to $68.99. Reports that stockpiles fell at the U.S. storage hub in Cushing, Oklahoma, is giving a lift to the commodity. At midday, advancers outpace decliners 1559/1221 on the NYSE and 1579/1226 on the Nasdaq. On the economic front, we received initial weekly claims and factory orders. 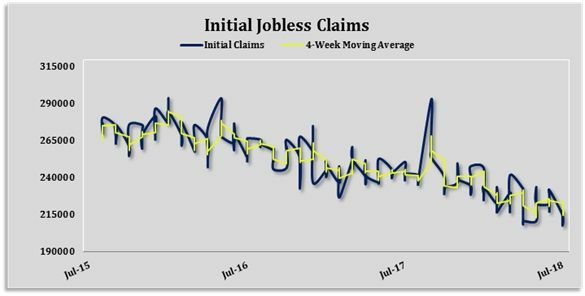 Weekly initial claims for the week ending July 21 rose by 9,000 to 217,000, while the four-week moving average, a better gauge, declined by 2,750 to 218,000. Continuing claims were down 8,000 to 1,745,000 and the four-week moving average was up 9,500 to 1,745,750. This marks 177 consecutive weeks that initial claims have been below 300,000. The numbers continue to point to a tight labor market. Factory orders for June increased 0.7% from an unrevised increase of 0.4% in May. Excluding transportation, orders were up 0.4%, from May’s revised 0.8% increase. 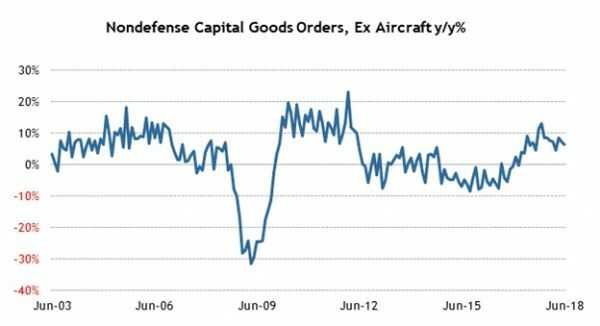 Shipments of non-defense capital goods, excluding aircraft, were softer than the +1.0% reported in the Advance Durable Goods Order report, which may indicate that the forecast for the second estimate of Q2 GDP could be lighter.